Last week we hosted our first meetup in a long time, in London. Here's our group. While we're planning to host more of these, I'm thinking maybe we should be attending as many as we host. So I'm wondering - are there any Meetups you attend and enjoy? We're checking out Java and Angular meetups, but I thought you guys have suggestions for places to meet and learn from the wider developer community. Just a quick note to say many thanks to you and Francesco for organising the London Developer Meetup. Yes, Alfresco meetups are gone from some time ago, good news to know they are back Kristen. My last Alfresco meetup was in 2014 in Granada with Toni de la Fuente and Fran Alvarez, between others. I enjoy them because there are a good of oportunity to know people of the community in a more relaxed atmosphere (not company related and more people related). 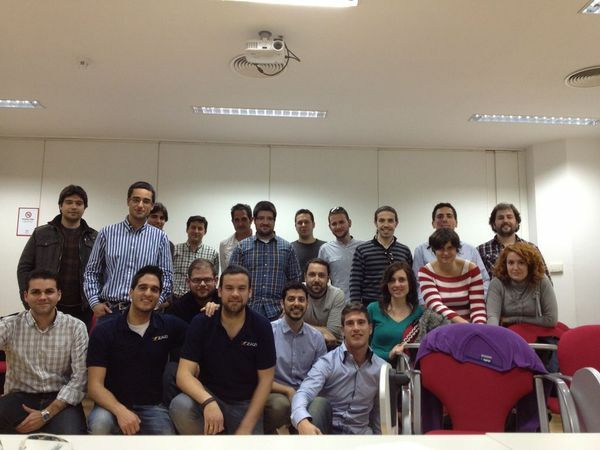 My first contact with Alfresco Community was precisely, an Alfresco Community Meetup some years ago in Madrid. Hey Cesar Capillas I have a photo for that Meetup (if you want I can share it with you ;-)). As he said, Kristen Gastaldo, I hope that this year there will be new Alfresco Meetups, at least more than last two or three years. The one than César is commenting was organized by the community (we made some here in Spain looong time ago). I hope we can participate on them soon ( I miss them!! ;-)). We are planning to host at least 1 meetup/quarter. While I don't think we'll be able to do more than that, we'd really love to start supporting our community members who want to start hosting meet ups on their own. We can help in preparing the content, sending some Alfresco merch (or maybe employees), etc. We have a lot of remote employees, who would love to attend these as well. If anyone is interested in hosting, let me know! We have the Alfresco Meetups doc that anyone can edit as well, should you have something scheduled! Yes please send me, we met Joaquin Reyes in that meetup !! The only one I had the opportunity to participate was the one in Brazil, with Richard Esplin, in 2012. We used to maintain a page on meetups with write-ups and photos: Past Community Events. It looks like that list is missing the meet-ups mentioned here and in the comments. I had the chance to attend Data Pioneers - Brussels (Brussels, Belgium) | Meetup which was a bit interesting. But no plans for other meetups in 2017! On June 20th 2018 we (Alfresco & it-novum) are hosting a Alfresco Meetup in Berlin. See the event page for more details and for the registration!